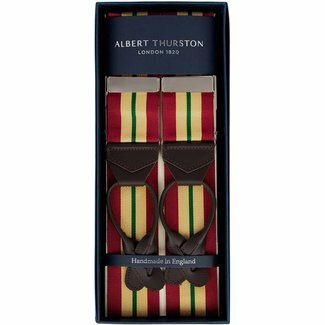 Albert Thurston Men's Braces with trendy green camouflage de..
Striped braces made by Albert Thurston. 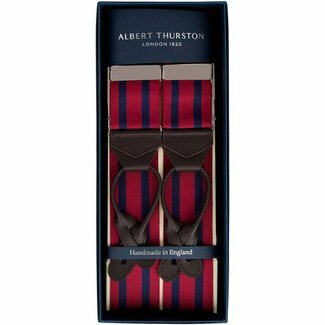 Attach the suspender..
Striped multi coloured braces made by Albert Thurston. 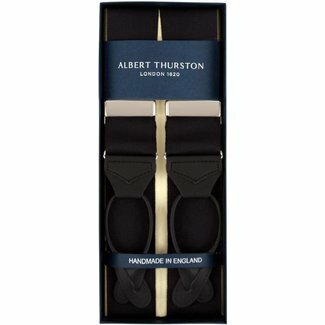 Attac..
Albert Thurston black braces. 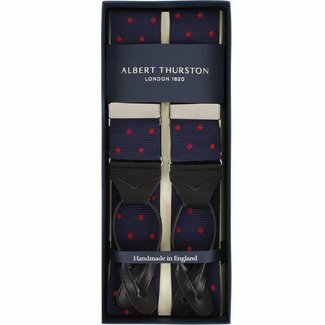 These braces have hand stitche..
Albert Thurston braces navy with gold-coloured skull and bon..
Albert Thurston braces navy with red polka dots and hand sti..
White suspenders made by Albert Thurston. This model is fini.. 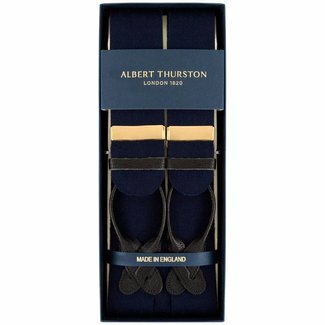 Dark blue boxcloth braces. 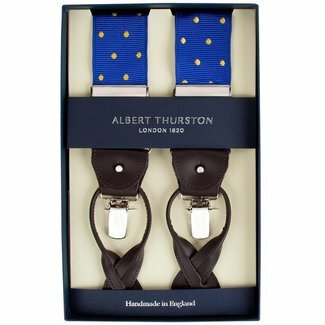 Exclusive Albert Thurston braces ..
Blue braces made by Albert Thurston. This model is finished ..
Blue polka dot braces made by Albert Thurston. This model is.. 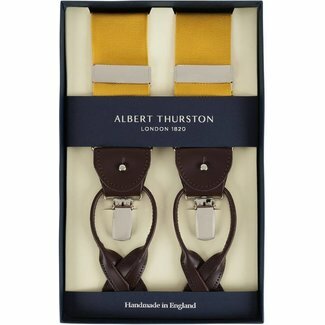 Luxury Braces Ochre made by Albert Thurston. 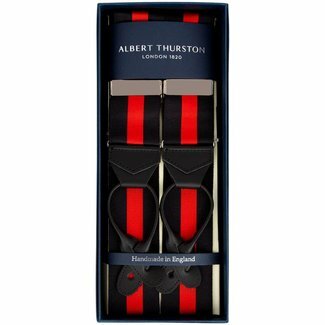 This model is f..
Albert Thurston braces beige with a red stripe. 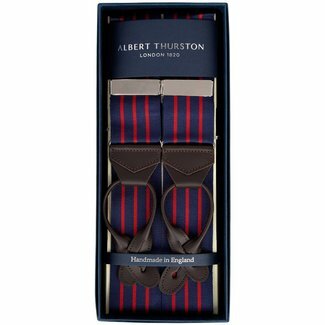 This model ..
There’s not much more which looks quintessentially more British than a pair of high quality braces and to get the very best, the obvious choice is Albert Thurston. 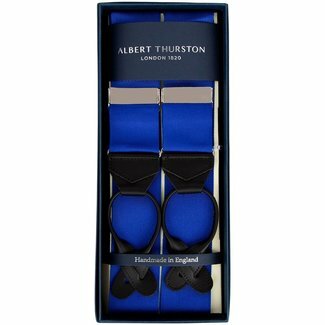 With decades of experience in creating bespoke men’s accessories, the finish, design and stitching on a pair of Albert Thurston braces is second to none, so it’s perhaps not surprising that they lead the market. 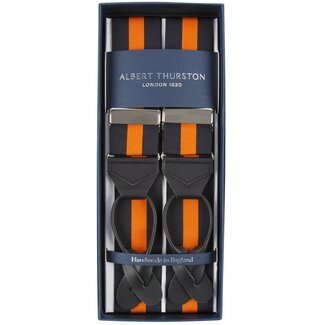 Braces remain today a highly desirable accessory, adding a touch of class and elegance to any gentleman’s outfit. 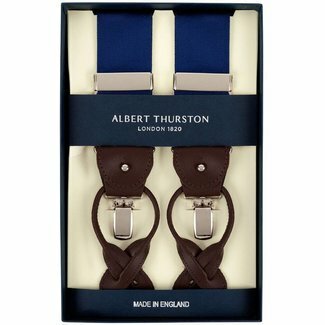 Albert Thurston has a long and distinguished history in the manufacture of braces, beginning in Haymarket in London in 1820. 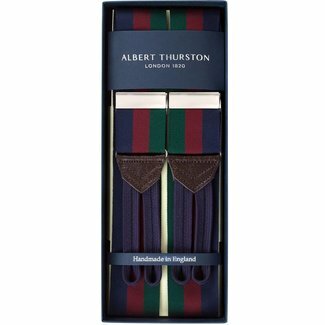 Producing distinctive braces and suspenders was what the family business quickly became known for, so much so that just three decades later when the Great Exhibition was being held, Albert Thurston’s products received an Honourable Mention due to the high quality of their goods. 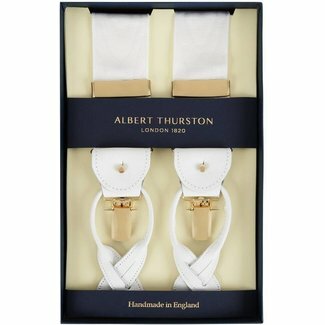 The company continued to gain a reputation for providing gentlemen’s accessories of the very highest quality and in particular, braces and suspenders. 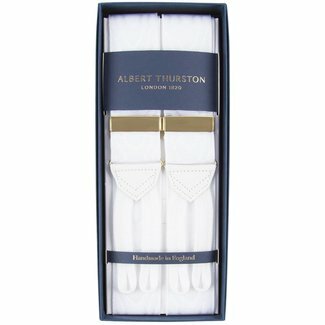 Albert Thurston’s name became synonymous with high quality and their goods sought after all over the globe. Gentlemen of the very highest order were proud to wear their designs including presidents, princes and kings as well as successful businessmen. Even the outbreak of World War II wasn’t sufficient to dent the popularity of the quality products. 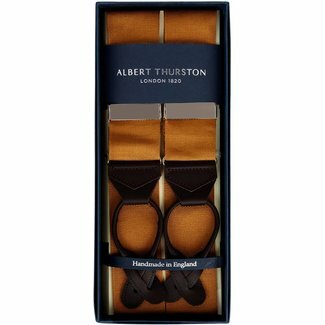 When Sir Ralph Richardson was asked to respond to the news about the war, he said that his priority had been to hotfoot it to his Savile Row tailor to purchase six pairs of Albert Thurston braces in case they ran out! 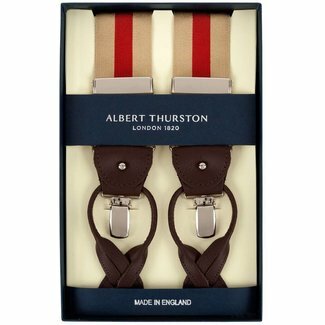 Although suspenders and braces aren’t worn as regularly as they were in the past, they remain a staple of the gentleman’s wardrobe and an essential accessory. 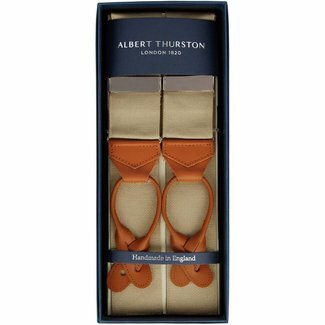 And when braces and suspenders are needed there’s nowhere else to turn to but Albert Thurston. 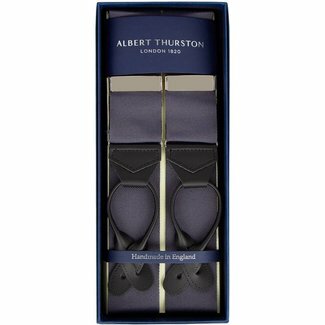 But it’s not just the ordinary man on the street who wears Albert Thurston with pride; the products continue to be sought out by the rich and famous and have even starred in a number of films and Hollywood productions. These include Wall Street starring Michael Douglas, and Leap of Faith starring Steve Martin. 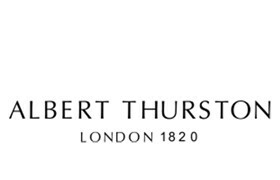 Almost two centuries after they first set out, Albert Thurston maintains a presence on Savile Row as well as providing high end braces to quality retailers all over the world. 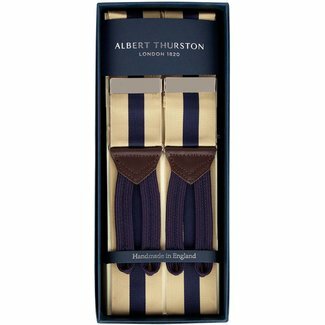 Every set of suspenders and braces is imbued with the quiet elegance of the Thurston brand, and is finished in immaculate detail. 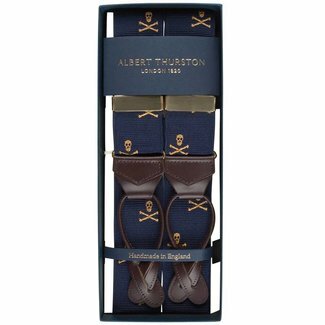 With hand stitched leather and a variety of designs, no matter which Albert Thurston product you choose to wear, you’ll be the proud owner of the very best braces and suspenders available. 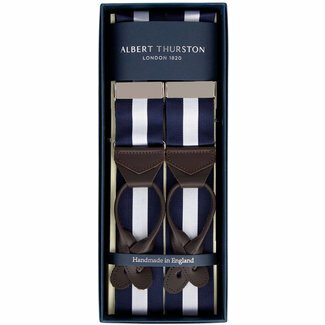 The Albert Thurston range of braces and suspenders is extremely diverse, encompassing a wide range of styles and tastes and perfect for every occasion. One particularly popular choice is the replica of the braces Daniel Craig sported as James Bond in Casino Royale and Skyfall, made from a white moire with brass fittings and white leather loops. But there’s every colour on the spectrum available from camouflage to sophisticated black, plus patterns too such as polka dots and skull and crossbones design. 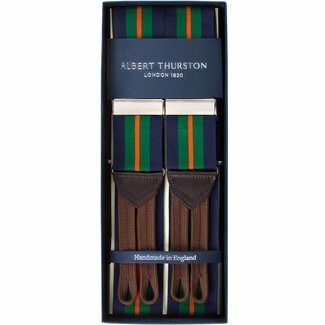 If you’ve not chosen your Albert Thurston braces and suspenders today, come and have a browse at what’s on offer and indulge yourself in real quality.